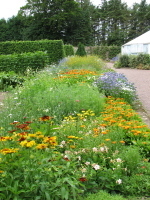 On Thursday morning we went to Threave Gardens, which is an old estate that is now the training ground for the Scottish National Trust gardeners. 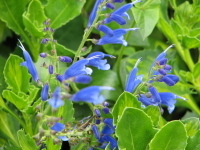 It was a lovely garden, with lots of exotic plants, some of which were labeled. But a lot weren't, which I found very frustrating. It was the kind of garden that I wished we'd been able to come for a guided tour, as I'm sure I would have learned a lot more with someone there to answer questions. But it was lovely just to walk around, and I got pretty exhausted from hiking over the whole estate. 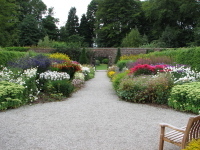 Due to the harsh climate, you find many walled gardens in Scotland. The stone walls are beautifully crafted. 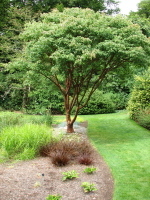 A paperbark maple and another great flower border. A naturalistic rockgarden and an arts and crafts garden room. 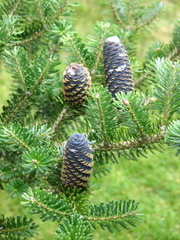 An arboretum, marked by a wooden sculpture of a giant pine cone. I noticed a few familiar North American natives among the woodland plants - baneberry and goatsbeard. I liked this stone sculpture a lot. This one was interesting, but we weren't quite sure what to make of it. We signed up for a guided hour of the house, and in retrospect, I think this was something I would have been happy to skip. The tour guide (the lady on the right in the picture below) was very enthusiastic and told me a lot more than I really needed to know about the Scottish family who lived in the house, which was originally built as a hunting lodge in 1872. Scotland Gardens are so beautiful! 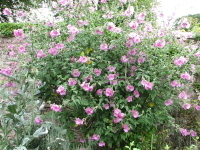 I have read about them in many gardening guides.